In Fifty Places to Paddle Before You Die, the newest addition to the Fifty Places series, Chris Santella explores the best destinations for the diverse sport of paddling. 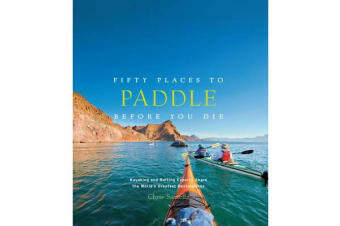 The book features the world’s top spots for kayaking, canoeing and rafting, examining these sports from novice to expert levels. Santella chooses gorgeous locations with wide-ranging appeal, including everything from salt water trips, and places that emphasise whitewater technique, to calmer expeditions and fresh water destinations. From classic sea-kayaking venues in coastal Maine, to the breathtaking jungle-river experiences, as well as edgier whitewater courses, the book takes readers on diverse paddling adventures around the world. In addition to destination recommendations, the book features interviews with paddling experts and first-hand accounts from those who have travelled on Santella’s routes. He also explores the culture of paddling and these locations are brought to life with beautiful, vibrant photography.